Elerium, otherwise known as element 115, is the energy source for all alien technologies. Mined from reserves near Cydonia, it has a variety of uses. However, it cannot be found on Earth. This item appears in UFO: Enemy Unknown (1994), XCOM: Enemy Unknown (2012), and The Bureau: XCOM Declassified. For the Terror from the Deep equivalent, refer to Zrbite. Elerium cannot be synthesized on Earth; it can only be obtained from UFO Assaults or Alien Base Assaults. Elerium is housed within UFO Power Sources, and is very fragile. If upon starting a UFO assault you find a UFO Power Source to have been destroyed (as a result of a crash landing), its Elerium will surely have been destroyed as well. Be careful about using explosives near intact UFO Power sources, as the Elerium within is easily toasted! At the end of a successful mission, any Elerium contained within intact UFO Power Sources will be automatically collected and returned to your base. If for some reason you need to end a mission prematurely, you can still collect Elerium by hand, by shooting open a UFO Power Source (generally with a plasma weapon). For more on securing Elerium in this way, see UFO Power Sources. Perhaps the most efficient way to gain a stock of Elerium is to find an Alien Base and attack the Supply Ships as they land nearby. Leave the base intact to attract more supply ships, as the Elerium is worth more than the score penalty (150 units per intact Supply Ship). See details here. UFO Power Sources can also be found in some Alien Bases, if they have a particular base "module". You can raid such a base without having to win the mission, and have a soldier carry the Elerium back to the entry lift and then abort (see Alien Base Assault#Smash And Grab for more details). Attacking the base's Supply Ships is likely to be a safer and more reliable source of Elerium, however; see UFO Recovery Values#Alien Base Assaults for more details. On the map, Elerium appears as a purple ball (the same graphic as a Stun Bomb on the ground). This object is worth 50 points of Elerium. During Base Defence, some of your own Elerium from stores may appear on the battlescape. This is a Good Thing™ if you win the mission, as each unit is represented as a pod and can be recovered for fifty units. This is probably a bug and appears to be absent from the Collector's Edition. Don't sell Elerium. Although you do have the option to do so, this is to be discouraged. It is used to fuel the Firestorm, the Lightning, and the Avenger. It is also used, in varying amounts, to manufacture most Alien Artefacts, Flying Suits, and various other technologies. Given that you can only obtain Elerium in the battlefield, selling it is not a good idea. Furthermore, the market price is a real rip-off, it will only fetch you $5,000 per unit. Consider that the highly abundant Alien Alloys are worth $6500 each. Furthermore, which would you rather have, 1 Blaster Bomb or $15,000? 1 Stun Bomb or $5000? Raw Elerium ore, as depicted in The Bureau. While not a resource itself in this squad-based shooter, the energy packs serving as ammunition for laser and plasma weaponry almost certianly are Elerium-based power cells. Furthermore, it's stated that the invading alien forces have been on Earth for some measure of time, and have been seeding Elerium into the Earth, to prepare the planet for terraforming operations. Indeed, the first level is in Groom Range, Nevada (AKA: Area 51), where the United States has been conducting research into Elerium technology: we see the Outsiders dropping generator "Seeds" into the ground, which absorb the surrounding Elerium-enriched land, terraforming the areas and using the crushed materials to grow massive Towers that are central to their invasion. 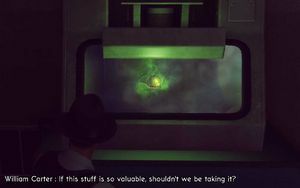 In the first level, which passes through an Elerium Lab, a sample of unprocessed Elerium can be seen bouncing violently inside a containment unit: a green glowing substance, caked with dark brown clods. It is unclear whether this is pure Elerium in it's true form, or the result of Elerium contaminted with local earth (or vice versa). Ununpentium, the temporary name for synthesized element 115, was only created briefly in atomic laboratories in 2004 and is not the subject of much research. Research in 2013 again confirmed the existence of element 115.. As of June 2016, the IUPAC has given the proposed name of Moscovium. It's inclusion into UFO mythos, and thus, into X-COM's lore began when UFO 'researcher' Robert Lazar made several claims about E-115 in the 1980's. For example, he claimed that it would be the only element that had a gravitational field extending past it's own atomic 'shell'. This deviance from the normal rule would be so significant that perhaps the technologies seen in the X-Com series could become a reality - anti-gravity devices used for both flight and particle acceleration. However, the basis for Bob's presumption is based on his misunderstanding (or outright lie) of the relativistic effects involved in large atoms, specifically that of Element 83, Bismuth. The relation to 83 to 115 is based on the fact that some elemental properties of atoms can be predicted based on the number of protons (which define the Atomic Number), reflected in the organizational system of the Periodic Table: Element 115 would be placed directly below 83 and within the "Poor Metal" Series and Group 15 elements (and thus, should share some properties). Thus, 83 was chosen because 115 would be just outside the known, well-researched, and easily accuired elements, but potentially in the theoretical Island of Stability, putting it in a realm of (conditional) plausibility, but well outside the range of casual experimentation (as opposed to, say, the ease of disproving the "magical" effects of homeopathy or magnetic bracelets). This page was last edited on 11 August 2018, at 04:14.